U.S. Senator Charles Schumer (D-NY) on Monday wrote a letter to the CEOs of Apple and Google expressing his concern with next-generation mapping technologies the two companies are employing, saying that the information gathered by highly-sensitive imaging equipment could lead to inadvertent privacy breaches and even aid in terrorism. Although Sen. Schumer didn't use the phrase "spy planes" in his letter to Apple chief executive Tim Cook and Google CEO Larry Page, a press release issued on the senator's website regarding the matter did mention the term and described the two company's efforts as utilizing "military-grade" hardware. The senator noted that, while services like Google Maps have in the past used satellite imagery, the new imaging technology allows for resolution of up to 4 inches. While Sen. Schumer is referring to high-resolution photographic equipment, at least one of the assets Apple acquired in developing the new iOS Maps app, a mapping company called C3 Technologies that was once part of Saab AB's defense arm, does use once-classified military targeting tech to achieve impressively realistic interactive maps. Apple announced its new proprietary Maps app for iOS last week finally putting a cap on rumors that the company was ready to launch a product that combined the technology of over two years worth of mapping company acquisitions. Google beat the iPhone maker to the punch and revealed their own 3D mapping software upgrade earlier in June. 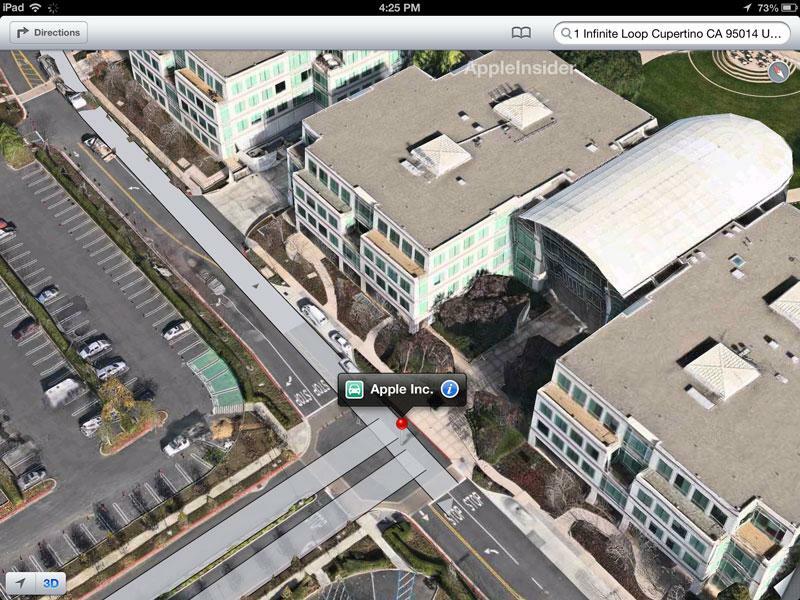 Apple's new Maps app will debut in iOS 6. While the world's militaries rely on satellite imagery that is highly-restricted, Google's system gets by with digital overlays of photographic models taken from planes the company owns. Apple's "Flyover" tech uses a similar system that renders 3D recreations in real time. I write today over the recent revelations that your companies are using highly sensitive photography equipment to take pictures of cities and towns across the country for your respective mapping products. These disclosures are potentially troubling, and I request that the privacy and security of Americans remain your top priority as you deploy new mapping and imaging capability. It has been reported that some of these sensitive cameras can take pictures of objects up to four inches wide. I fear that this clarity may allow your mapping programs to take detailed pictures of people in intimate locations such as around a pool or in someones backyard. People on Long Island or in Buffalo have a reasonable expectation of privacy when they decide to have a barbeque on their back deck and would prefer to retain the option of deciding whether they should be photographed on their property. They should not fear that your planes will be overhead taking detailed pictures of their private events. Detailed photographs could also provide criminals and terrorists with detailed views of sensitive utilities. On current online maps, many power lines, power sub stations, and reservoir access points are visible only at low resolutions. However, if highly detailed images become available, criminals could create more complete schematic maps of the power and water grids in the United States. With the vast amount of infrastructure across the country, it would be impossible to secure every location. I hope that you would be willing to work with my office on this very important issue and ensure the security and privacy of all Americans. Apple and Google have yet to respond, though likely precautions may be akin to those seen in Google's Street View which blurs out license plates and other imagery deemed sensitive in nature.